On Wednesday, April 27th, the Statistical Institute of Belize released its latest figures on prices and external trade for the country. The report indicates that prices increased for the month of March, on average, by 0.1%. 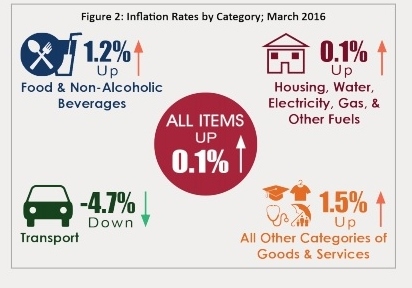 The Consumer Price Index from March 2016 stood higher at 102.9 compared to 102.7 of March 2015. After more than a year of decreased prices, January 2016 recorded its first increase. However, the first quarter of this year’s inflation rate is gradually decreasing from a high of 0.4% since January. Due to a 4.4% increase in fruits, the prices from the “Food & Non-Alcoholic Beverages” category recorded an increase of 1.6%. Animal products continue to increase as eggs increased by 8.2 percent, beef and veal increased 16%, and pork increased by 5.5%. Sugar also increased by 29.5%. On the other hand, red kidney beans managed to reflect a decrease of 14.5%. The transport category recorded a 4.7% decrease as the prices of regular and diesel gasoline decreased by 0.9%, and 6.2% respectively, and international airfares significantly decreased by 32%. But premium gasoline spiked an increase by 1.8%. For butane gas, the average price of a 100-pound cylinder decreased from $93 in March 2015 to $84 in March 2016. In the area of Housing, Water, Electricity, Gas and Other Fuels, prices increased marginally by 0.1%. Home rental prices increased by 0.7% and since the beginning of 2016, this trend continues to rise due to the decreases in electricity and LPG prices. Across Belize’s seven towns, Corozal and Punta Gorda recorded the highest inflation rates of 1.7% and 1.3%. Over the first quarter, Corozal reported an increase from 1.0% in January to 1.5% in February. For the first three months of 2016, the inflation rate of Punta Gorda has been steady. San Ignacio, Santa Elena, and Belize City stood at negative 0.3%, while Dangriga records the lowest inflation rate of negative 1.0%, a downward trend from 4.0% in January and negative 0.9% in February 2016.